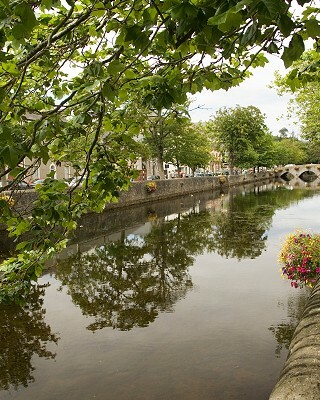 Very charming 150 year old one bedroom town house in the centre of Westport town. A lovely, unique property, carefully modernised and full of character, furnished with antiques and quality soft furnishings. A private, cosy and comfortable setting, perfect base for your stay in the West. Located on the Mall with all the amenities of our award winning town on your doorstep and free (non-designated) parking at the front and a paved patio at the rear. The location is superb, right in the centre of town, bike hire, Great Western Greenway, shops, restaurants and pubs are all within a few metres. Stunning beaches and walks, Croagh Patrick, Westport House and Gardens, are all within easy reach. Accommodation comprises a small entrance hall, living room, kitchen/dining room with granite worktops and a Rayburn oil fired stove (central heating and cooking), access to the paved patio, downstairs w.c. Upstairs there is a double bedroom with two sliding sash windows overlooking the Fairgreen, and a shower room. Both these rooms have timber floors and original cast iron fireplaces.